Fiber optics have expanded the capabilities and possibilities of networks beyond our expectation. Fiber patch cable serves as a common yet indispensable part which determines connection quality between fiber optic equipment, therefore it has no tolerance to any contaminant like dust and dirt. So keeping the end face of patch cables clean to ensure performance and reliability of the network is vital. This article offers general tips on patch cable cleaning, while introduces some professional tools that help simplify the process. Why Is Patch Cable Cleaning Critical? It is claimed that over 85% of fiber related problems in data centers, campus, and other enterprise or telecom environments are caused by contaminated connectors or end-faces. Which can often lead to degraded performance, or even worse, failure of the whole network system. So, cleaning consideration is always put in a paramount place in optical network transmission. To ensure proper performance and reliability, care must be taken with the installation and maintenance of patch cable end face, as well as the removable fiber connectors. 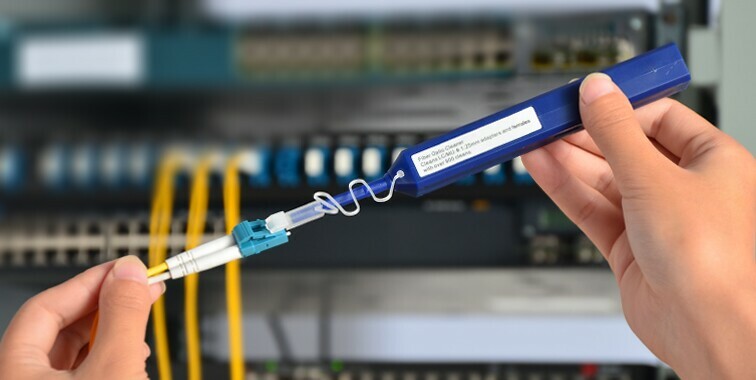 Because data are transmitted through the small core of the fiber patch cable, a very small amount of dirt or residue may significantly increase the connector’s attenuation and weaken the signal. Lack of applying proper patch cable cleaning procedures can directly impact the quality of the system’s performance. fiber patch cable cleaning is one of the most rudimentary and essential procedures to ensure network availability and reliability. The following lists some general suggestions when performing patch cable cleaning. Point 1: Try to work in a clean area. Avoid working around heating outlets. Point 2: Always keep dust caps on connectors and bulkhead adapters for as long as possible. Only remove the dust caps to clean the components prior to making a connection. Point 3: Never touch the ferrule end face of a fiber optic connector. No matter what you do, you will leave contamination behind. Point 4: Always clean connectors before inserting into an adapter. Use specialized cleaning tools or lint free pads and isopropyl alcohol to clean. Point 5: Ferrules on the connectors/cables used for testing will get dirty by transference of contaminants from alignment sleeves in the bulkhead adapters, so test cables and adapters should be cleaned or replaced regularly when testing a large system. It is important to have proper fiber patch cable cleaning tools to facilitate the cleaning job, which will greatly minimize the cleaning time and difficulty, making the cleaning process easier and more efficient. The commonly used patch cable cleaning tools are illustrated as follow. a. Push-type cleaners (one-push cleaners): this pen-shaped push-type cleaners feature an easy one-push action, which quickly and effectively cleans the end face of connectors on patch cables or through adapters without any alcohol or harsh chemicals. Always select the cleaner model for the connector type to be cleaned, 2.5mm for SC, FC and ST, and 1.25mm for LC and MU. 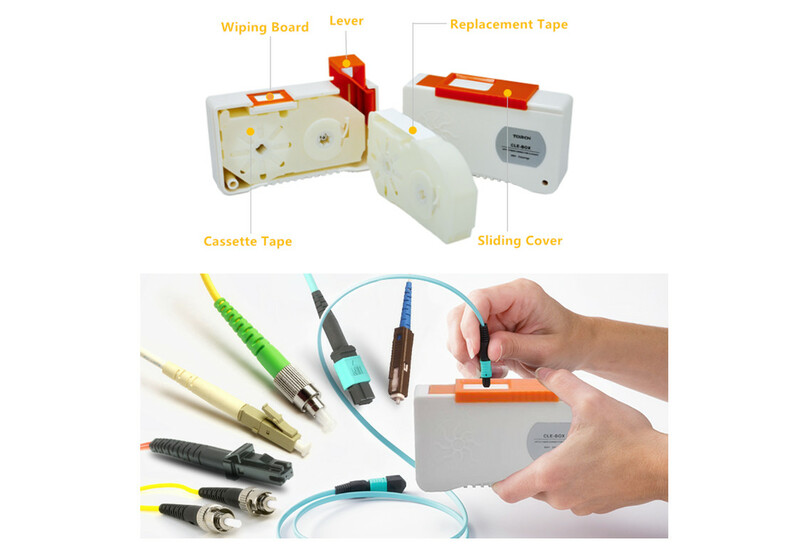 b. One-push MTP/MPO cleaner: this cleaner is specifically designed to clean MTP/MPO connector end face on patch cables or in adapters. The unique design enables effective cleaning of either male (with pins) or female (without pins) connector, in fiber breakout modules and even networking gear like switches and routers. c. Reel-type cleaners (cassette cleaners): they typically contain a lint free reel of cloth that is moved after each cleaning, always presenting a clean surface. Reel-type cleaners are safe patch cable cleaning options without the need for alcohol. Besides, they have refillable cleaning tapes, making them ideal for lab, assembly lines and field use. d. Wipes and cleaning cards: there are a wide variety of patch cable cleaning wipes and cleaning cards for both field and manufacturing applications. They can be used either dry or with cleaning fluid to remove common contaminants for effective patch cable cleaning. e. Cleaning swabs & sticks: Precisely designed, the mini foam clean swabs are made to serve various different patch cable cleaning and maintenance needs. Foam swabs are ideal for more precision cleaning where linting needs should be avoided. Swabs assist in cleaning small or hard to reach items. 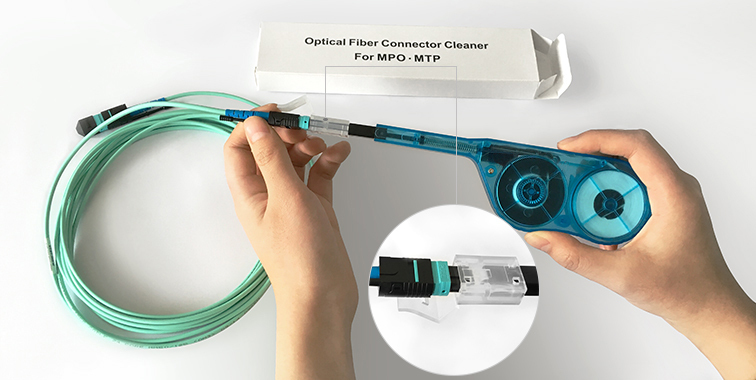 For best optical performance, it is imperative that all fiber patch cable connections are clean and free of contaminants. An easy to use patch cable cleaning tool becomes a necessity for fiber technicians and installers. Even without specific training, field technicians and fiber installers can use a simple insertion and push motion to remove residue, debris and dust that can negatively impact network performance. So why not grab a patch cable cleaning tool to make your job easier? This entry was posted in Connectors & Adapters, Fiber Optic Testers & Tools, Fiber Optic Tools and tagged cassette cleaner, fiber patch cable cleaning, fiber patch cable cleaning tool on February 10, 2017 by Aria Zhu.